PayPal this morning announced an expanded partnership with Apple, which will now see the payment method becoming available as an option on iOS devices, in addition to being available in more markets. Before today, U.S. users could add PayPal as their payment method on iTunes desktop on Mac and Windows when configuring their Apple account, but this expansion means that same feature will be expanded to 11 new countries. This list includes Canada, Mexico, Spain, Italy, Israel, France, the U.K., Australia, Germany, Austria and the Netherlands. PayPal said this morning the rollout begins today with Canada and Mexico, and others will go live “soon.” However, we understand that the feature has actually reached all the newly supported markets. PayPal appears to have quietly changed its blog post’s wording to reflect this, as well. 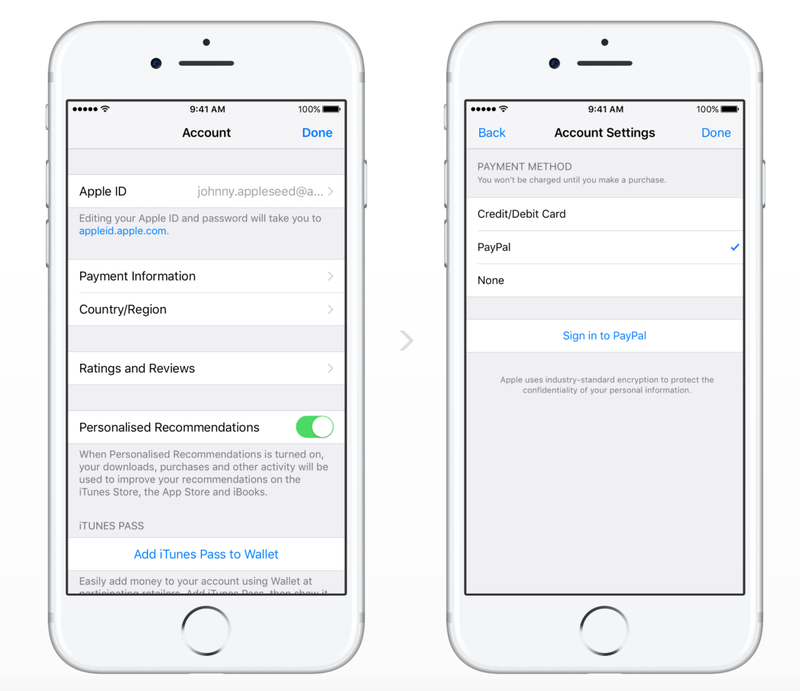 Once added, users in the supported markets will be able to use PayPal to pay for their purchases in the App Store, including in-app purchases and subscriptions, as well as things like Apple Music, iTunes TV shows and movies, iBooks and iCloud storage — no matter what device they’re using with their Apple account. In addition, PayPal will be added as a payment option directly on iOS, which was not previously available, the company tells us. This will be available in all 12 markets, including the U.S. and the newly added 11 others. That means you’ll now be able to go into your iOS Settings and switch your account’s default payment method over to PayPal right on your iPhone, iPad or iPod touch. After doing so, all your purchases will be charged to PayPal — no credit or debit card required. This includes those purchases you may make via your Apple TV or Apple Watch, too, says PayPal. Both new and existing customers will be able to switch their account to use PayPal as the default method when the feature goes live in their market. This is done by making a change to their account settings in the App Store, Apple Music, iTunes and iBooks store on their iPhone, iPad, iPod touch, Mac, or via iTunes on their Windows PC. Being a new payment option directly on Apple mobile devices could be a big boost for the payments company, which also notes that it’s leveraging its One Touch technology to support the new Apple ID account integration. One Touch is generally used to speed up checkout on web and mobile by skipping the PayPal login screen after the first use, as long as you’re in the same device or browser. With Apple, the One Touch component is how the Apple ID is linked to PayPal. That way, when you purchase something using your Apple ID from the App Store, you skip the password field that PayPal normally requires. Update: CNBC reports that PayPal shares hit an all-time high of $56.99 on the Apple partnership news.